The income statement, also called the profit and loss statement, is a report that shows the income, expenses, and resulting profits or losses of a company during a specific time period. The income statement is the first financial statement typically prepared during the accounting cycle because the net income or loss must be calculated and carried over to the statement of owner’s equity before other financial statements can be prepared. It’s important to note that there are several different types of income statements that are created for different reasons. For example, the year-end statement that is prepared annually for stockholders and potential investors doesn’t do much good for management while they are trying to run the company throughout the year. Thus, interim financial statements are prepared for management to check the status of operations during the year. Management also typically prepares departmental statements that break down revenue and expense numbers by business segment. In the end, the main purpose of all profit and loss statements is to communicate the profitability and business activities of the company with end users. Each one of these end users has their own use for this information. Let’s look at who uses the P&L and what they use it for. Who Uses an Income Statement? There are two different groups of people who use this financial statement: internal users and external users. Internal users like company management and the board of directors use this statement to analyze the business as a whole and make decisions on how it is run. For example, they use performance numbers to gauge whether they should open new branch, close a department, or increase production of a product. External users like investors and creditors, on the other hand, are people outside of the company who have no source of financial information about the company except published reports. Investors want to know how profitable a company is and whether it will grow and become more profitable in the future. They are mainly concerned with whether or not investing their money is the company with yield them a positive return. Creditors, on the other hand, aren’t as concerned about profitability as investors are. Creditors are more concerned with a company’s cash flow and if they are generating enough income to pay back their loans. Competitors are also external users of financial statements. They use competitors’ P&L to gauge how well other companies are doing in their space and whether or not they should enter new markets and try to compete with other companies. Single-step income statement – the single step statement only shows one category of income and one category of expenses. This format is less useful of external users because they can’t calculate many efficiency and profitability ratios with this limited data. Multi-step income statement – the multi-step statement separates expense accounts into more relevant and usable accounts based on their function. Cost of goods sold, operating and non-operating expenses are separated out and used to calculate gross profit, operating income, and net income. In both income statement formats, revenues are always presented before expenses. Expenses can be listed alphabetically or by total dollar amount. Either presentation is acceptable. P&L expenses can also be formatted by the nature and the function of the expense. 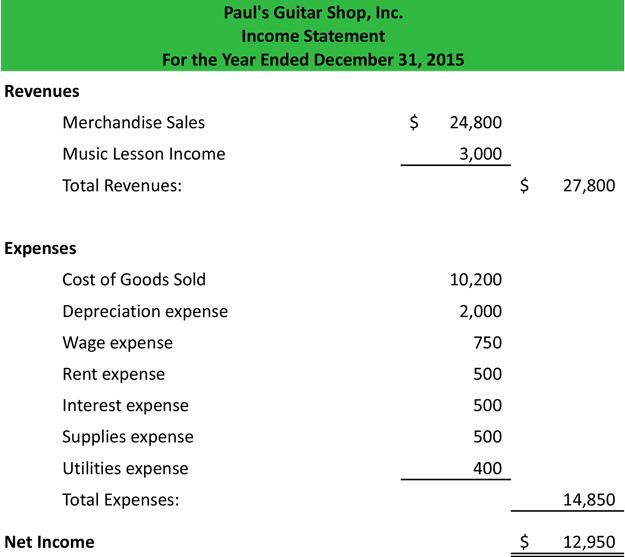 Here is an example of how to prepare an income statement from Paul’s adjusted trial balance in our earlier accounting cycle examples. As you can see, this example income statement is a single-step statement because it only lists expenses in one main category. Although this statement might not be extremely useful for investors looking for detailed information, it does accurately calculate the net income for the year. This net income calculation can be transferred to Paul’s statement of owner’s equity for preparation. What is considered an expense on the income statement? Expenses are outlays of resources for goods or services. These costs include wages, depreciation, and interest expense among others. They are reported on several sections of the income statement. Cost of goods sold expenses are reported in the gross profit reporting section while the operating expenses are reported in the operations section. Other expenses are reported further down the statement in the other gains and losses section. How do you calculate the income statement? The income statement is used to calculate the net income of a business. The P&L formula is Revenues – Expenses = Net Income. This is a simple equation that shows the profitability of a company. If revenue is higher than expenses, the company is profitable. If revenue is lower than expenses, the company is unprofitable. What is a multi step income statement? A multi-step statement splits the business activities into operating and non-operating categories. The operating section includes sales, cost of goods sold, and all selling and admin expenses. The non-operating section includes other income or expenses like interest or insurance proceeds. How do you make an income statement? Use one of our templates to list the sales, expenses, and other gains or losses in the correct format. At the bottom of the statement, compute the net income for the company. 2.1 What is an Income Statement Used For? 2.2 Who Uses an Income Statement?